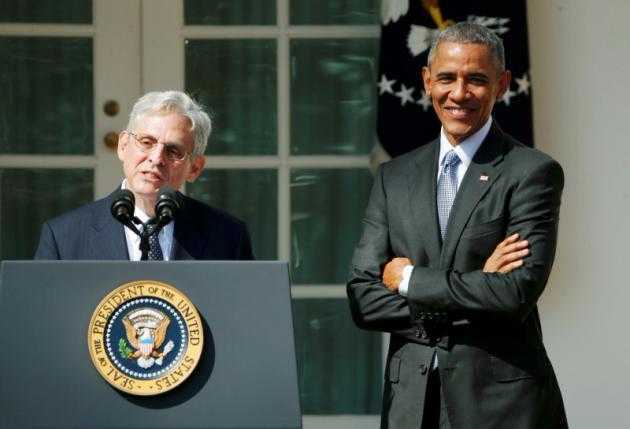 WASHINGTON (Reuters) — President Barack Obama nominated veteran appellate court judge Merrick Garland to the U.S. Supreme Court on Wednesday, setting up a potentially ferocious political showdown with Senate Republicans who have vowed to block any Obama nominee. Considered a moderate, Garland, 63, is currently chief judge of the U.S. Court of Appeals for the District of Columbia. He was picked to replace long-serving conservative Justice Antonin Scalia, who died on Feb. 13. “I’ve selected a nominee who is widely recognized not only as one of America’s sharpest legal minds but someone who brings to his work a spirit of decency, modesty, integrity, even-handedness and excellence,” Obama said in the White House Rose Garden. “These qualities and his long commitment to public service have earned him the respect and admiration of leaders from both sides of the aisle (Democrats and Republicans). He will ultimately bring that same character to bear on the Supreme Court, an institution in which he is uniquely prepared to serve immediately,” Obama added. Senate confirmation is required for any nominee to join the bench and Senate Republicans have vowed not to hold confirmation hearings or a vote on any nominee picked by the Democratic president for the lifetime position on the court. Republicans are demanding that Obama leave the seat vacant and let the next president, to be elected in November and sworn in next January, make the selection. Garland, is a long-time appellate judge and former prosecutor who Obama also considered when he filled two previous Supreme Court vacancies. Federal appeals court judge Sri Srinivasan had also been a finalist for the nomination. In a foreshadowing of the pressure campaign the White House and its allies plan to wage in the coming weeks, the White House noted that seven current Republican U.S. senators voted to confirm Garland to the DC Circuit court in 1997. Garland, who has earned praise from lawmakers of both parties in the past, was named to his current job by Democratic President Bill Clinton in 1997, winning Senate confirmation in a 76-23 vote. Prior to that, he worked in the Justice Department during the Clinton administration. Without Scalia, the nine-member Supreme Court is evenly split with four liberals and four conservative justices. Obama’s nominee could tilt the court to the left for the first time in decades. Republicans, hoping a candidate from their party wins the Nov. 8 presidential election, want the next president to make the selection. Billionaire Donald Trump is the leading Republican presidential candidate. Obama’s former secretary of state, Hillary Clinton, is the front-runner on the Democratic side. Republicans and their allies already have geared up to fight Obama’s nominee. The Republican National Committee on Monday announced the formation of a task force that will work with an outside conservative group to spearhead attack ads and other ways of pushing back against Obama’s choice. The U.S. Court of Appeals for the District of Columbia Circuit has served as a springboard to the Supreme Court for several justices including Scalia in recent decades. Obama may have been looking for a nominee who could convince the Republicans to change course. Garland could fit that bill with his moderate record, background as a prosecutor and history of drawing Republican support. Garland was under consideration by Obama when he filled two prior high court vacancies. Obama, in office since 2009, has already named two justices to the Supreme Court: Sonia Sotomayor, who at 55 became the first Hispanic justice in 2009, and Elena Kagan, who was 50 when she became the fourth woman ever to serve on the court in 2010. Presidents tend to pick nominees younger than Garland, so they can serve for decades and extend a president’s legacy. But Obama may reason that the choice of an older nominee might also entice Senate Republicans into considering Obama’s selection. Trump, speaking on ABC’s “Good Morning America” program, said it was critical for Republicans to take back the White House to avoid Democrats shaping the Supreme Court. “You have four Supreme Court judgeships coming up, and that would mean they would take over, that would mean for 50 years, probably, this country will never be the same,” Trump said. “The Republicans should do exactly what they are doing. I think they should wait till the next president and let the next president pick,” Trump said.